Most of the people who purport to possess expertise about the economy rely on a common set of presuppositions and modes of thinking. I call this pseudo-intellectual mishmash vulgar Keynesianism. It’s the same claptrap that has passed for economic wisdom in this country for more than fifty years and seems to have originated in the first edition of Paul Samuelson’s Economics (1948), the best-selling economics textbook of all time and the one from which a plurality of several generations of college students acquired whatever they knew about economic analysis. Long ago, this view seeped into educated discourse and writing in the news media and in politics and established itself as an orthodoxy. Higgs then dissects “the six most egregious aspects of this unfortunate approach to understanding and dealing with economic booms and busts.” These are the aggregation of myriad and disparate economic actions, failure to take into account changes in relative prices, misunderstanding of the meaning and economic role of interest rates, disregard for the importance of capital, blind “money pumping” as a “solution” to recessions, and disregard for the disincentivizing effects of government activism on the private sector. I agree with everything said by Higgs, and I have said many of the same things (in my own way) at this blog and its predecessor. 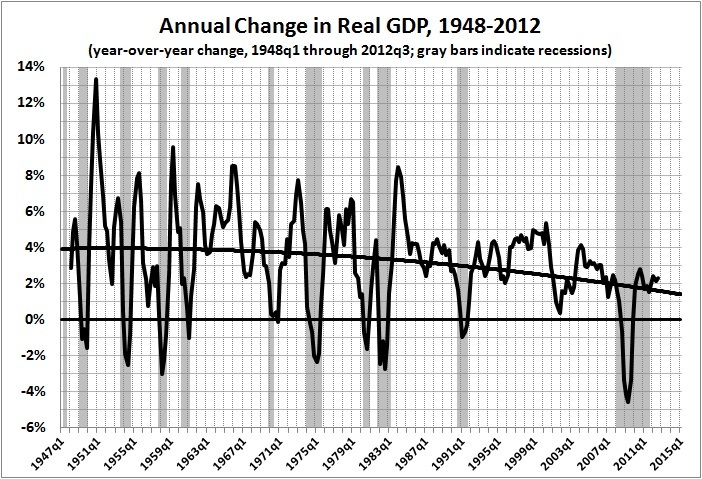 However, GDP — an aggregate measure of economic activity — is a useful construct, as flawed as it may be. It is an indicator of the general direction and magnitude of economic activity. Other aggregate measures — such as employment, jobs added and lost, unemployment rate — are also useful in that regard. If, for example, constant-dollar GDP per capita was twice as high in 2010 than it was 40 years earlier, in 1970 (computed here), it indicates that most Americans enjoyed a significantly higher standard of living in 2010 than they and their predecessors did in 1970. Further, the difference is so significant that it overshadows the difficulty of aggregating the value of billions of disparate transactions and separating the effects of price inflation from quality improvements. Can we measure the price of government intervention [in the economy]? I believe that we can do so, and quite easily. The tale can be told in three graphs, all derived from constant-dollar GDP estimates available here. The numbers plotted in each graph exclude GDP estimates for the years in which the U.S. was involved in or demobilizing from major wars, namely, 1861-65, 1918-19, and 1941-46. GDP values for those years — especially for the peak years of World War II — present a distorted picture of economic output…. 1970-2008 — annual growth of 3.1 percent – [2.8 percent for 1970-2010] an economy sagging under the cumulative weight of “progressivism,” New Deal legislation, LBJ’s “Great Society” (with its legacy of the ever-expanding and oppressive welfare/transfer-payment schemes: Medicare, Medicaid, a more generous package of Social Security benefits), and an ever-growing mountain of regulatory restrictions. Because the vulgar Keynesian has no conception of the economy’s structure of output, he cannot conceive of how an expansion of demand along certain lines but not along others might be problematic. In his view, one cannot have, say, too many houses and apartments. Increasing the spending for houses and apartments is, he thinks, always good whenever the economy has unemployed resources, regardless of how many houses and apartments now stand vacant and regardless of what specific kinds of resources are unemployed and where they are located in this vast land. Although the unemployed laborers may be skilled silver miners in Idaho, it is supposedly still a good thing if somehow the demand for condos is increased in Palm Beach, because for the vulgar Keynesian, there are no individual classes of laborers or separate labor markets: labor is labor is labor. If someone, whatever his skills, preferences, or location, is unemployed, then, in this framework of thought, we may expect to put him back to work by increasing aggregate demand, regardless of what we happen to spend the money for, whether it be cosmetics or computers. Note that this “aggregate production function” has only one input, aggregate labor. The workers seemingly produce without the aid of capital! If pressed, the vulgar Keynesian admits that the workers use capital, but he insists that the capital stock may be taken as “given” and fixed in the short run. And ― which is highly important ― his whole apparatus of thought is intended exclusively to help him understand this short run. In the long run, he may insist, we are, as Keynes quipped, “all dead”; or he may simply deny that the long run is what we get when we place a series of short runs back to back. The vulgar Keynesian in effect treats living for the moment, and only for it, as a major virtue. At any given time, the future may safely be left to take care of itself. 1. A broad array of capital goods (e.g., metal presses and railroad cars) will produce the same outputs (e.g., auto body parts of a certain quality and a certain number of passenger-miles) despite wide variations in the intelligence, education, and motor skills of their operators. 2. That is to say, capital leverages labor (especially unskilled labor). 3. Rewards justifiably — if unpredictably — flow to those who invent capital goods, innovate improvements in capital goods, invest in the production of such goods, and take the risk of owning businesses that use such goods in the production of consumer goods and services. 4. The activities of those inventors, innovators, investors, and entrepreneurs constitute a form of labor, but it is a very special form. It is not the brute force kind of labor envisaged by Marx and his intellectual progeny. It is a kind of labor that involves mental acuity, special knowledge, a penchant for risk-taking, and — yes, at times — hard work. Without capital, labor would produce far less than it does. Capital, by the same token, enables labor of a given quality to produce more than it otherwise would. Notes: Current-dollar values for GDP and G are from Bureau of Economic Analysis, Table 1.1.5. Gross Domestic Product (available here). Capital stock estimates are from Bureau of Economic Analysis, Table 4.1. Current-Cost Net Stock of Private Nonresidential Fixed Assets by Industry Group and Legal Form of Organization (available here). Current-dollar values for GDP – G and capital stock were adjusted to 1982-84 dollars by constructing and applying deflators from CPI-U statistics for 1913-present (available here). Notes: Residual GDP – G derived from Fig. 1, as discussed in text. Estimates of new investment in private capital stock are from Bureau of Economic Analysis, Table 4.7. Investment in Private Nonresidential Fixed Assets by Industry Group and Legal Form of Organization (available here); adjusted for inflation as discussed in notes for Fig. 1. Knowledgeable readers will understand that I have taken some statistical liberties. And I have done so as a way of satirizing the view that prosperity depends on labor and its correlate, consumption spending. But my point is a serious one: Capital should not be denigrated. Those who denigrate it give aid and comfort to the enemies of economic growth, that is, to the “progressives” who are the real enemies of the poor, of labor, and of liberty.